Salt Air has a laid-back beach house character, with 180 degree views of beach rockpools, surf and mountain silhouettes from the sunroom, dining room or outside on the spacious patio. It captures year-round sun from its prime north-facing position on the oceanfront reserve. A short barefoot walk from the garden gate brings you to pristine white sand beaches - depending on whether you head east or west, either the protected Abraham's Bosom beach or the surf beach stretching for miles to Culburra. The boat ramp, general store, Zacs restaurant and tennis courts are all within 3 minutes walk. One of Currarong's original beach houses, Salt Air is fresh and light, having been newly renovated inside and out to enhance its contemporary style and facilities. The great thing about Salt Air is that it is genuinely 5 bedrooms with 3 queen rooms, a twin room and a bunk room, 3 bathrooms and multiple living spaces. This allows flexible combinations of family and friends - everyone has real privacy and space. The living areas are spacious: cozy gas fireplace living area with television, dining area and large sunroom (with loads of seating space and great for games), opening onto the ample elevated terrace with outdoor setting for 8-10. It's a superb place to watch the sunset. What's special is that it is still private, thanks to the gardens. Currarong is a uniquely beautiful and quiet place on the south coast. This is a village, without motels. These are beaches without parking lots. This is beach and bush at its best. Visitors tend to be regulars, drawn by the clean surf of Warrain Beach and sheltered Bosom Beach, the superb boating, rock and ocean fishing, sea kayaking, scuba diving and snorkelling, the bushwalks featuring rugged headlands and coves. Explore historic Point Perpendicular lighthouse or visit magic Honeymoon Bay, which are a short drive away in Beecroft Range. Oh, and in the season, whales do frolic in the bay! Currarong is on the Beecroft Peninsula, the northern headland of Jervis Bay. Its 32km from Nowra. From Sydney the drive generally takes a little over 2 1/2 hours or from Canberra, 3 hours. HOPE YOU COME. HOPE YOU ENJOY. HOPE YOU REFLECT ON JUST HOW BEAUTIFUL THIS QUIET PART OF THE AUSTRALIAN COAST IS! Salt Air is right on the oceanfront reserve, with stunning 180 degree views from the patio, sunroom and dining room. It is a short barefoot walk to the boat ramp, Abraham's Bosom beach and the shops. Living room with cosy gas "log" fireplace and large sun room with seating for 10. 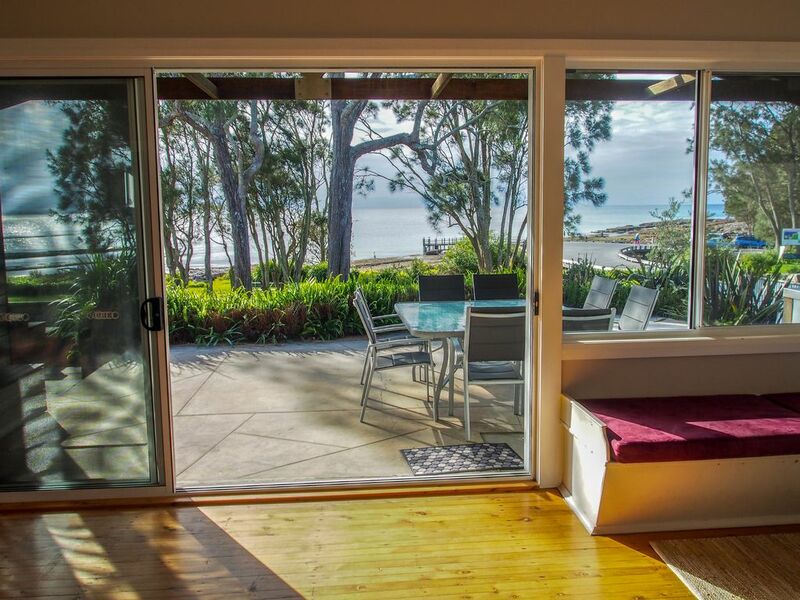 Salt Air is a spacious, comfortable house in a gorgeous position, right on the waterfront at Currarong. Position is perfect. However, the house needs a bit of TLC. For example, holes in mosquito screens, windows not able to be closed properly. Also, there are no ceiling fans and only one fan in the whole house. We had to buy our own. A few minor repairs and some ceiling fans would make this an excellent holiday spot. Dear Mary, Thank you so much for taking the time to provide feedback to us regarding aspects of Salt Air that could have our guests be more comfortable. I hope you will consider staying with us again and we will adress the issues you have raised. Have you ever been on a Christian camp? You get the picture. Bring your own linen. Very clean and functional. Inadequate heating. But a fabulous location. This would be a wonderful venue for a multi family getaway or a camp for a small church! Really nice owner. The place was perfect. Great facilities and well laid out. The front deck was fantastic. All of the kitchen equipment was great, great BBQ and 2 fridges. Perfect for lots of us. The location too was perfect. 50m to load paddleboards, 150m to the rockpool and the jump offs, 400m to bosom beach, 100m from the shops and 300m to main beach. Perfect. Location! Location! Location.We celebrated a family birthday here, we had six children, plus a baby and three adults, it was perfect!! While having breakfast the crew sported a whale and calf, frolicking right out the front, fantastic, the house is very well equipped and very spacious, we will definitely make it our destination in the future, a great family holiday. What a great house and fantastic views. We had a very relaxing weekend here soaking up the spring sun. The house is awesome great for families and perfect for kids. We are already working out when we can go back!! We had a fantastic week. What a well equipped house it is, particularly the kitchen. It was a great kitchen to cook in and just to be in.